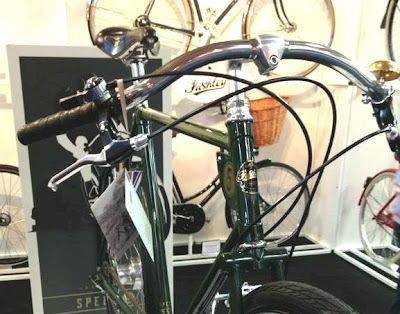 Perth Vintage Cycles: The Pashley 'Speed 5' has arrived. 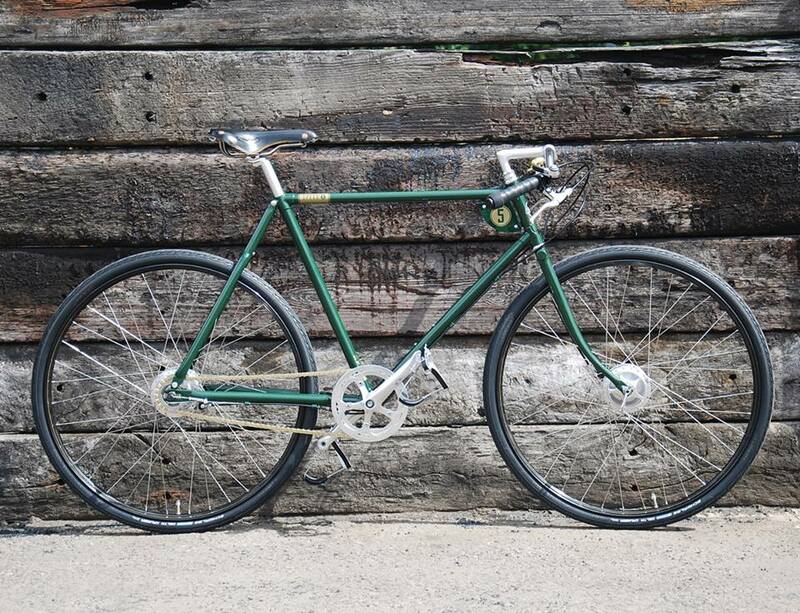 The Pashley 'Speed 5' has arrived. Eurobike 2013 was held recently in Germany and as usual UK based Pashley Bicycles furnished a beautifully designed display stand with their new and exciting models. 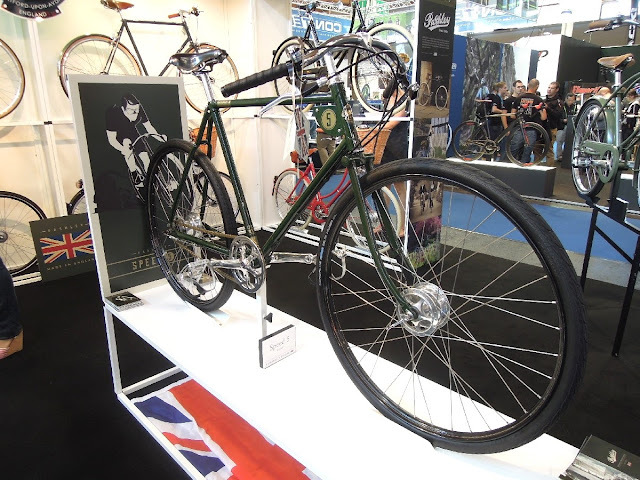 Pashley never fail to disappoint .....and this year was no exception. The 2013 Eurobike stand heralded the launch of three new models for Pashley. For me the most outstanding was a new machine they have called the 'Speed 5'. The Speed 5 on display at Eurobike 2013. The release of the 'Speed 5' is a great marketing strategy when you consider the success and popularity of it's older stablemate the Guv'nor. The 'Speed 5' is essentially a Guv'nor that has been 'tricked' up with a 5 speed Sturmey Archer rear hub and a few other little extras. The new breed looks like a Guv'nor, has the classic 1930's geometry of the Guv'nor, but on closer inspection the vintage cycling enthusiast will see some fantastic new features. The first obvious difference is of the frame colour. The 'Speed 5' is generously powder coated in British Racing Green, a perfect colour choice for a machine that is typically English. 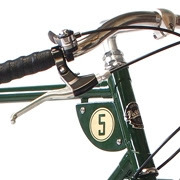 The frame also has a small racing number plate adorning the number 5 tucked in behind the head tube. A small but stylish feature reminiscent of the 1930's path racing era....and of course there are no prizes for guessing what the '5' eludes to. Racing plate behind the head tube. Pashley Speed 5 - side profile. Other upgrades from the standard Guv'nor include the 5 speed Sturmey Archer rear hub with internal brake, a black leather Brooks "Swift" saddle with chrome railing, and a gold half-link chain. Another obvious difference with the Guv'nor series is that the 'Speed 5' has black Schwalbe 28 x 1 1/2 inch tyres instead of the more traditional white tyres that come standard on the Guv'nor. The black coloured 28 inch Westwood rims with gold piping remain the same. Black Schwalbe tyres, and a gold half link chain. GB wing nuts come fitted on the front hub of the 'Speed 5' as standard - a really nice touch! 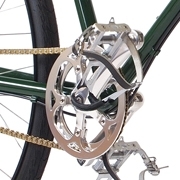 Although I am surprised that the designers at Pashley didn't opt for a stylish GB chain set that has been spied on some of their earlier models, perhaps this isn't an option right now. 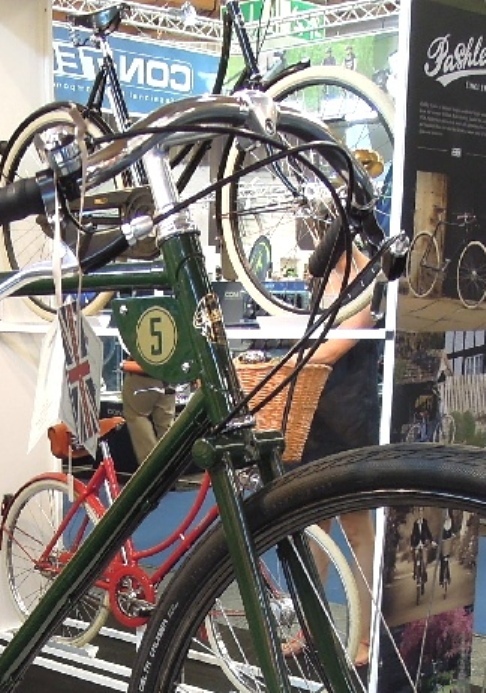 I've also noticed that the pedals on the Eurobike display version are probably MKS Sylvan Road pedals with steel cages and leather straps.....unlike the Guv'nor that has MKS Sylvan Stream pedals fitted as standard. So you think that the release of the new 'Speed 5' is all good news don't you. Well it isn't. The dilemma now arises for Guv'nor owners: How do I tell my wife I want another Pashley?? .....and of course if the kind folk at Pashley are keen to have their new machine road tested on the streets of Perth, Western Australia, I'm more than happy to put my hand in the air. Until next time, safe pedalling. Nice review. Thank you. 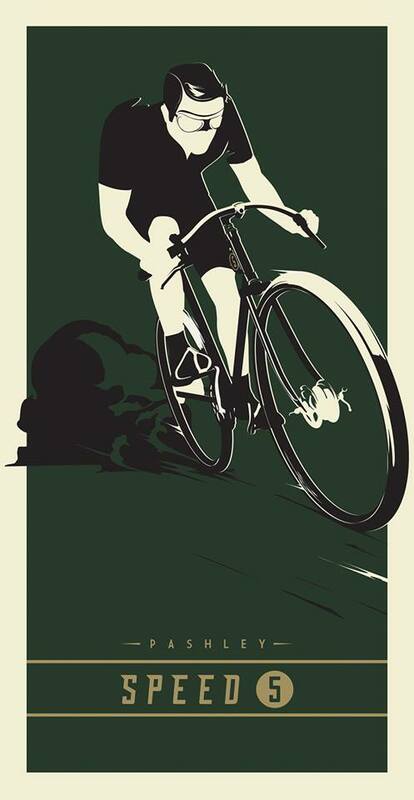 I bought a Pashley Sovereign a few years back and Guvnorised it. Removing the mudguards, heavy saddle etc reduced the weight enormously. I added a 52T Sturmey Archer chain-ring, rat-trap pedals, toe-clips and staps and a nice B17 saddle and cream Delta-Cruisers. 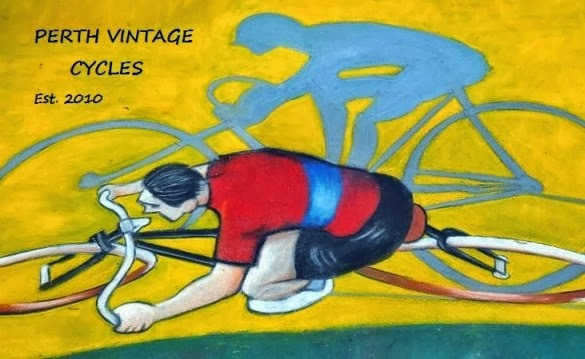 Very eye-catching and a joy to ride - not least because it was always 5- rather than 3- or single-speed.I'm delighted to see that Pashley have now cottoned on to the fact that a 3-speed racing bicycle has limitations for the modern rider. Maybe I'll rebuild the bike after painting British racing green as splashing out the thick end of a grand is a wee bit steep.